A deck collapsed at a Narragansett beach house on Saturday leaving multiple students injured and shaken. Photo contributed anonymously. Over the weekend on Saturday Feb. 3, an off campus party went from fun to horror after the household deck collapsed to the ground. 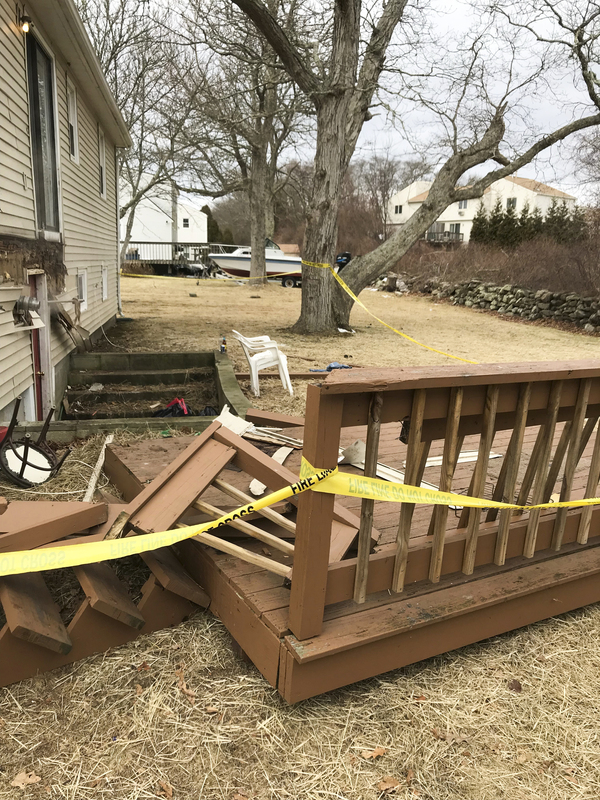 The house, located on Sakonnet Boulevard in Narragansett, started off as a regular day party, also known as “darty.” The fun quickly ended after the around 7-foot tall deck let go from the house causing dozens to fall. One person fell a total of around 12 feet after falling into the concrete stairwell that led into the basement located under the deck. Police were originally called to the scene for a noise disturbance at 4:47 p.m., being tipped off that there was a party going on, and arrived on the scene within seconds of the deck collapsing. The police on scene reported that around 75-100 people were standing in front of the house crying, yelling and shouting. Some were still holding and consuming alcoholic beverages, others were fleeing the scene from all sides of the house. “We need help, we need help, our deck just collapsed and several people are injured,” said one of the student renters of the house, according to the police arrest record. While no life threatening injuries occured, one was sent to the hospital. The injured person reported that they had just stepped out onto the deck when it collapsed which resulted in a fall of 10 to 12 feet, landing on her hip and then had their legs pinned down by several others who had fallen. A person who attended the party, who wishes to remain unidentified, told the Cigar that despite recent rumors that the party was a rush event, the party originally was an informal house party. The renters of the house, who are involved in Greek Life, invited over friends and individuals they liked during rush events all from multiple fraternities and sororities. Things managed to get out of control when an informal rush darty was busted by police and the students from that party came over to the party on Sakonnet. The anonymous source observed an estimate total of around 200 to 250 people in attendance prior to the deck collapsing. They also observed around 15 to 20 people out on the deck originally, but as the party became overcrowded and the inside became hot, more and more people moved outside. Ultimately there was a total of five people charged, the four house renters who were charged with a social host violation and given a public nuisance warning and one charged with minor possession of alcohol.While only one party-goer was transported via ambulance to the hospital, others went to the hospital the next day. There have been reports of individuals who experienced pain, back spasms and broken ribs from the day after.